I used to put an image of my most recent ballot stub on this page on a fairly regular basis. 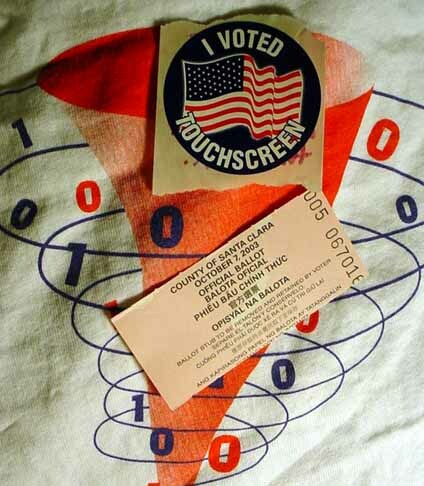 Unfortunately, now that we vote touch screen that habit has to become a thing of the past. As it looks now, my stub from the special election that ended Gray Davis's term is the last one I am going to get. Now they just give out these I VOTED ELECTRONICALLY stickers. I walked across the Great Seal of the State of California on Monday, December 18, 2000, during a rally on the west steps of the State Capitol. I gave my little speech to many people that day. Maybe I moved half a dozen stickers, including what was at the time my last spare one from the batch that yielded the one above the 3RBT181 below, which was the first message sticker on this car. Since then an old friend gave me one that he had kept from when I was pushing them during the Gulf War. Now I have two of them again, plus the one below and one on a poster that came with the slogan TIME TO CHANGE THE WORLD. Putting a MEND YOUR FUELISH WAYS over the Corporate Logo made that much better. 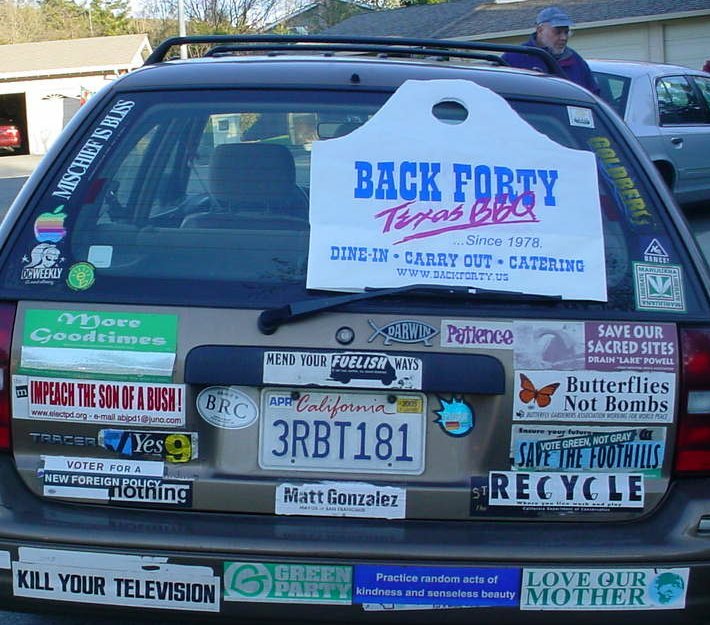 The Stickermobile has more than 140,000 miles on it. Most recent change: Picture taken 12/23/2004ish. I peeled off the "Nothing Accomplished" sticker from MoveOn.org to the left of the license plate a little while previously, but I didn't have time to take a new picture for this page that day. I like how it now says "IMPEACH THE SON OF A BUSH" again.